There are several species of lichens that often are sold as 'mosses', and reindeer lichen is one of the most common. It is frequently used in holiday and flower decorations and for trees and shrubs in train model making. This type of lichen grows on wet soil and rocks in northern temperate forests and are often harvested and sold commercially. SuperMoss, which is not a moss, but a lichen. Terrarium necklace with 'moss', which in this case is a lichen. © Catherine Weitzman for Uncommon Goods. fair use. 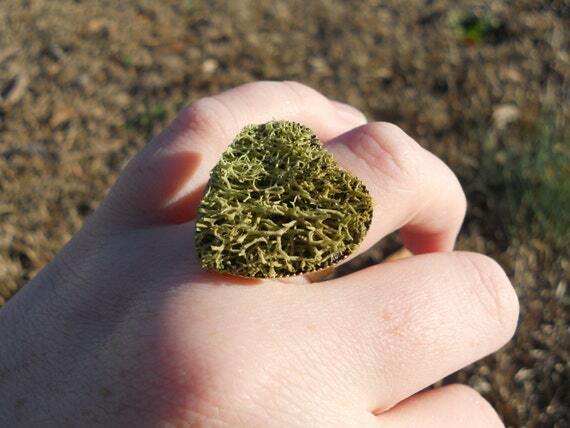 "Moss Heart Ring", also made only with a lichen, no moss. So, who cares if you call it a moss instead of a lichen? Well, those two organism are about as different as a cat and a katydid, and if you mixed up those two you would care, right? (For those that need to know, a katydid is like a giant, green grasshopper with long antennae. It is an insect, not a mammal, like a cat.) Reindeer 'moss' and the real mosses might look similar, especially when the lichen is stained artificially green, but they are very, very different and not closely related. Lichens are a kind of organism that is formed by a fungus and an algae (and bacteria too) that live together in symbiosis. 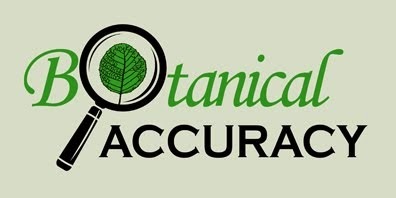 They can look crusty, leafy, bushy, and branchy and grow on soil, bark, rocks, and leaves. Often they are only green when wet, otherwise the fungus gives the lichen a more gray, white, yellow, or black color. The algae inside the lichen is a small microscopic plant that is related to planktonic and marine green algae (and a few green algae that live on land too). Green algae are the precursors to the land plants, including mosses. Lichens never have real leaves. Sometimes you can see lichens with colorful 'cups' on them, those are the sporangia of the fungus that can spread fungal lichen spores around. Lichens grow extremely slow and can live in many extreme environments (cold, heat, dry, etc.). Mosses are small land plants that spread with spores from structures called sporangia. Mosses have small real leaves on stems and no flowers. Mosses are most closely related to ferns, conifers, and flowering plants (instead of algae). 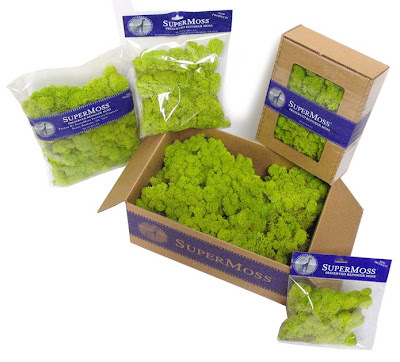 So, to sell something as a moss that is really a lichen is false marketing and provides the wrong product information. This linguistic mistake and error has been around for a long time, and it is time to change it. Of course, you can argue that common names are OK even if they are wrong, but why perpetuate such an error when we have the perfectly fine name 'reindeer lichen' already?